Limoncello is a favorite digestivo in all parts of Italy. With its bright lemon flavor, the sweetly sour liqueur is great to sip after a meal or as an addition to your favorite desserts— celebrity chef Giada DiLaurentis suggests pouring it over lemon sorbet and adding fresh berries to cap off a hearty meal. The best limoncello can be found near the source of Italy’s best lemons—in Campania. Whether called Sorrento, Sfusato or Amalfi lemons, the citrus fruits of this coastal region are legendary for their sweetness and aroma. Can’t wait for your next trip to Italy to get your hands on a bottle? Read on for an easy homemade limoncello recipe you can make at home to savor for yourself or give as a gift. 1. Peel the skin off of the lemons in long strips, taking care to separate the skin from the pith (the bitter white part). Trim any pith from the peels with a small, sharp knife. 2. Put the peels into your pitcher and cover with the vodka. Let steep for at least four days—while Italians traditionally wait 40 days, four is sufficient for a strong lemony taste. 3. Once your lemons have steeped, make a simple syrup by stirring the water and sugar in a saucepan for five minutes or until the sugar dissolves. 4. Let the syrup cool completely, then pour into the lemon mixture. Cover and let it stand at room temperature for at least six hours. 5. Pour the limoncello through the strainer and discard the peels. Use a funnel to transfer into bottles. To drink it the Italian way, keep your bottle in the freezer. Then, pour into small, chilled glasses and sip after a meal. 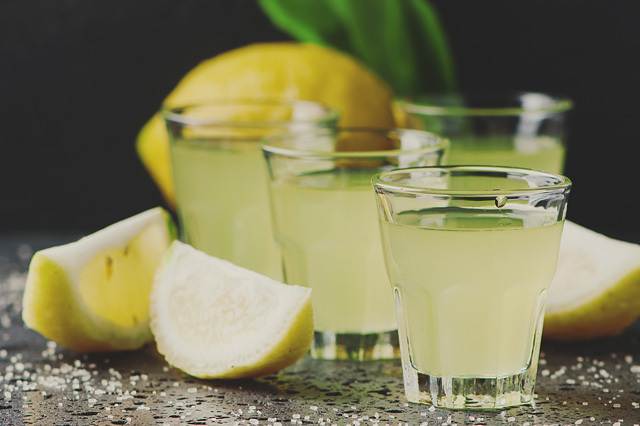 Have you ever tried limoncello? What did you think? Tell us in the comments!